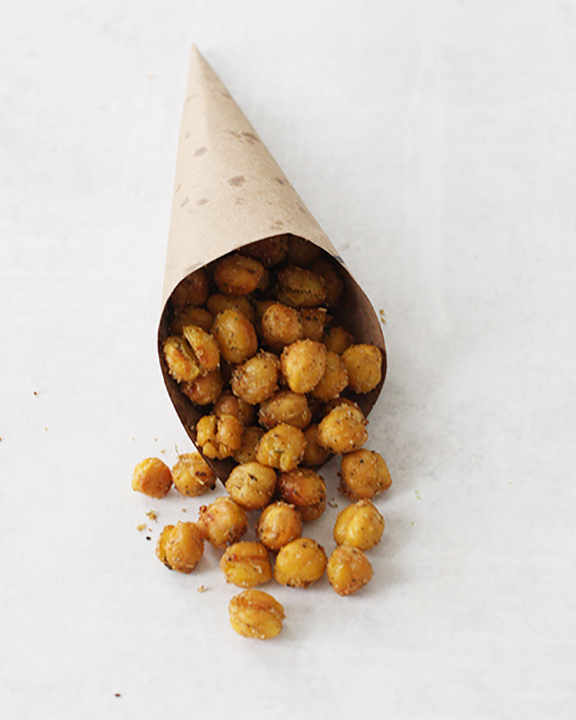 Did you know you can roast chickpeas to make a crispy, crunchy snack? Until recently, I did not. I had these falafel chickpea snacks awhile ago that got me thinking I could make them my own. If you read Meats and Sweets, you might have noticed that I really like to recreate foods I've had elsewhere, at home. This is especially great with packaged or processed food since home made versions are generally healthier and are free of weird undesirable ingredients. The chickpea snack that inspired me to make these, had canola oil which I avoid. By making my own, I was able to choose which oil I wanted. You can use canned chickpeas but I strongly suggest using dried chickpeas. This recipe works for 1 can drained chickpeas or 1.5 cups cooked chickpeas which is a half cup of dried chickpeas. To make prepare the dried chickpeas: measure out 1/2 cup of dried chickpeas and soak them in room temperature water overnight. They will absorb a lot of water during soaking so make sure they are covered with at least 2 inches of water. If you're short on time, use the quick soak method. For this method, add beans to a pot and cover with 2" water. Boil for 5 minutes. Turn off heat and let soak for 1 hour. After soaking, drain beans. They will now need to cook, as soaking only rehydrates the beans. To cook, place in pot of water, bring to a boil, reduce to a simmer and cook until tender, about 1.5 - 2 hours. Just start testing them for tenderness at the 1.5 hour mark. Just start testing them for tenderness at the 1.5 hour mark. Once done, drain. Chickpeas are now ready. First, dry chickpeas. Either leave the drained, cooked chickpeas out on a kitchen towel overnight or use a food dehydrator for about 30 minutes or let them dry out in the preheating oven for about 15 minutes. They must be dry in order to become crispy. Heat oven to 400 degrees. Line a baking tray with parchment paper. Set aside. In a bowl, mix cumin, salt, onion powder, garlic powder, fenugreek, black pepper and paprika. Add oil and mix. Add chickpeas and stir to coat. Arrange evenly on prepared baking tray. Bake 20 minutes or until crisp. Turn pan once halfway through baking. Cool before eating.